If you’re looking for a personal injury lawyer, you may feel as if you have a plethora of options. If you’re browsing the phone book or the Internet, you have probably been bombarded by injury lawyers who will make promises they can’t keep. Many of these attorneys offer “free injury lawyer consultations,” but there’s no such thing as a free lunch. However, at Link & Smith, P.C., we are always up front and honest about our services. You’ll find that other injury lawyers offer “consultations,” but we pride ourselves on being the accessible injury lawyers. A complimentary consultation means more than just a simple phone call; it means more than a conversation with a receptionist. A consultation means a face-to-face conversation with an attorney who is invested in your personal success. At Link & Smith, P.C., you won’t have any trouble getting in touch with us. A “complimentary consultation” with many other injury firms does not imply a real fact-to-face evaluation of your claim. Filling out extensive paperwork before you can even speak with a representative. Some Atlanta injury lawyers require you to submit online forms before you are able to have a conversation about your claim. Many injury lawyers charge a consultation fee. If your life has been turned upside down by a personal injury, naturally you do not have the time or money to spend on a consultation that may not even lead to substantial case results. “Consultations” with other lawyers could mean a long drive, or tediously trying to meet according to their schedule, not yours. “Consultations” with other injury attorneys do not always mean a face-to-face meeting. Other injury attorneys may not be invested in your individual success, and may view your case simply as a commodity to be used for profit. A complimentary consultation with one of our lawyers just takes one simple phone call. When you call our offices, you will speak to a real person, not an automatic voice recording. At Link & Smith, P.C., there are no online forms to fill out. Our attorneys treat you as an individual, and we do not feel the need to screen your claim before we speak with you. 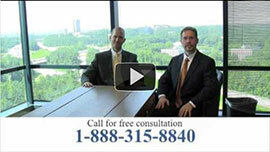 An injury lawyer consultation with a Link & Smith, P.C. attorney means that we will meet with you at your convenience. If you cannot come to our location, we will gladly meet you at your home, or another location convenient to you. A complimentary consultation with one of our lawyers means a face-to-face meeting. A face-to-face meeting implies that one of our attorneys will sit down with you and evaluate your claim, treating you as an individual, not just a means of profit. Finally, a complimentary consultation means a complimentary consultation! You will pay no up-front fees for a consultation with our lawyers, nor will you pay any up-front fees for your claim, because we work exclusively on a contingency basis. At Link & Smith, P.C., we exclusively handle personal injury claims, helping persons who have been injured in auto accidents, tractor-trailer accidents, motorcycle accidents, boating and jet-ski accidents, in addition to DUI victim representation. If you’ve suffered a personal injury, don’t hesitate to receive a complimentary consultation with the Atlanta injury lawyers who believe that serious injuries deserve superior results! To speak with one of our attorneys, call our offices at 404-315-8840. This entry was posted in Blog, Personal Injury Attorneys and tagged atlanta injury lawyer consultations, atlanta personal injury attorneys, personal injury lawyer complementary consulation, personal injury lawyers. Bookmark the permalink.